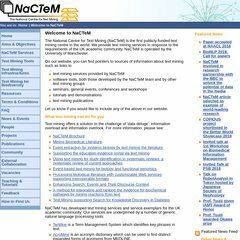 Topics: Aims & Objectives, Nactem Services, Text Mining Tools, People, Projects, and Publications. The estimated 147 daily visitors, each view 2.10 pages on average. There are 3 Nameservers, curlew.cs.man.ac.uk, utserv.mcc.ac.uk, and gannet.scg.man.ac.uk. It is hosted by University Of Manchester (England, Manchester,) using Apache/2 web server. The programming language environment is PHP/4.3.2. PING nactem.mc.man.ac.uk (130.88.203.28) 56(84) bytes of data.